Lt. Col. Reed Drake of the Montana Air National Guard recently became the fourth pilot in the world to fly 4,000 hours in the F-15. Family and friends gathered at the unit after his historic flight for a celebration. GREAT FALLS, Mont. June 10, 2009, Four thousand flying hours is an acknowledged milestone in any aviator's career, however 4,000 hours in one aircraft is truly an accomplishment. Lt. Col. Reed Drake of the Montana Air National Guard recently became the fourth pilot in the world to accomplish that feat. Immediately after his historic flight, Drake, whose call sign is “Snake,” was greeted with cheers by his fellow pilots, well wishers, media and family members. “My goal was to fly one hour in the F-15,” said Drake. “If I can get more, I’ll keep going.” Unlike many professional and military pilots, Drake did not want to be an aviator at an early age. His interest developed during his junior year in high school. He started college as a pre-med student and was introduced to the Reserve Officer Training Corp by a fellow classmate. “After I found out I could fly after graduating from the program, I became very interested,” said Drake. He graduated with a bachelor degree in computer science from the University of Texas and took his first F-15 flight in 1988, and said he’s never had a day where he didn’t look forward to going to work. 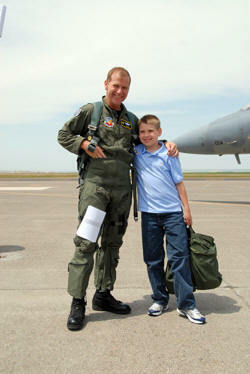 After entering the history books of the F-15, Drake said he felt honored to have a job that he loves. "Whatever you want and love to do, I'd say go for it because you get one chance in life to do it.” Lt. Col. Mike Buck, the 186th Fighter Squadron commander, presented Drake with a patch to wear on his flight suit depicting an F-15 with the word eagle in bold letters and 4,000 hours on the bottom. “It’s great to be able to bring him on board … he will be a tremendous help to our unit with the conversion,” said Col. Pete Hronek, the 120th Fighter Wing operations group commander. The Montana Air Guard is currently converting from the F-16 to the F-15 aircraft and anticipates being full-mission ready in April of 2010. The F-15 is a small, highly maneuverable jet plane designed to fly combat missions in all weather conditions. Its primary mission is maintaining air superiority. In other words, its ultimate purpose is to defeat other planes in aerial combat.